Wow! This is a first for me. It is not often that a Sound Technician (Me) gets top billing on the tickets for a show! I am usually happy with a listing in the show program or even a mention from the MC after the show is complete. Check out my name in BOLD next to BORDERLINE, the live band for the evening's entertainment. "Thanks Brigitte, that is awesome!" 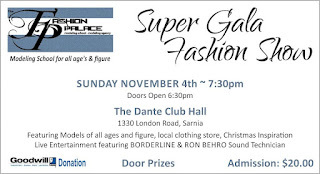 I have to thank Brigitte Bisson, the owner/operator of the Fashion Palace Modelling School located in Sarnia, ON. Originally, Brigitte contacted me back in 2011 looking for a sound technician for her fall fashion show at the Dante Club in Sarnia, ON. I accepted the job and the show went off without a hitch. Brigitte liked my work and she invited me to work the next show in the spring of this year. Yet, another successful show. Upon inspection of the Fashion Palace website, I noticed that Brigitte had added me to her list of staff members for the group. I don't even remember her asking me but, I am flattered that she likes my sound tech work so much! "Brigitte, I appreciate it very much"! For the upcoming show in November, I will also get to mix sound for "Borderline" a band that I get to regularily work with around the Sarnia/Lambton county area. 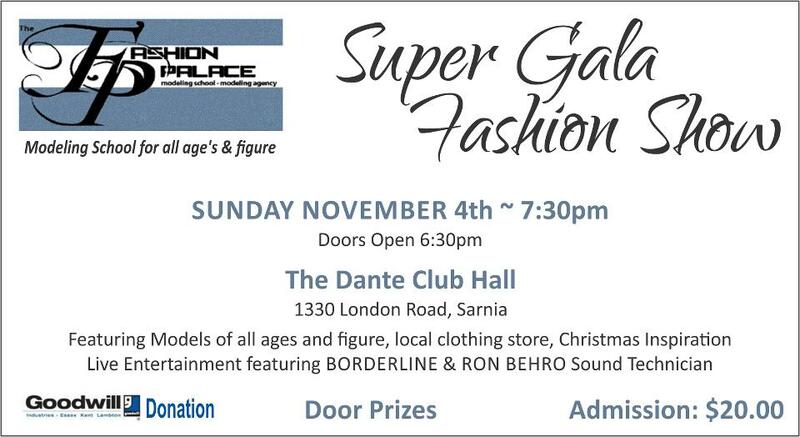 Borderline plans to play as a trio band for this fashion show without their regular drummer. "Maybe next time, Bruce". In addition to the sound mix required for the band and the fashion music playback, a more detailed, stage lighting is being asked for to make the next show that much better. With the help of my friend John from Borderline and his sound system, we are going to get together and design an excellent sound and lighting system for the next show! I am looking forward to an excellent fashion show in November 2012 and look forward to working with Brigitte and all the staff at The Fashion Palace group.